It was one of those nights when there’s just too much going on, and you have to make some choices. 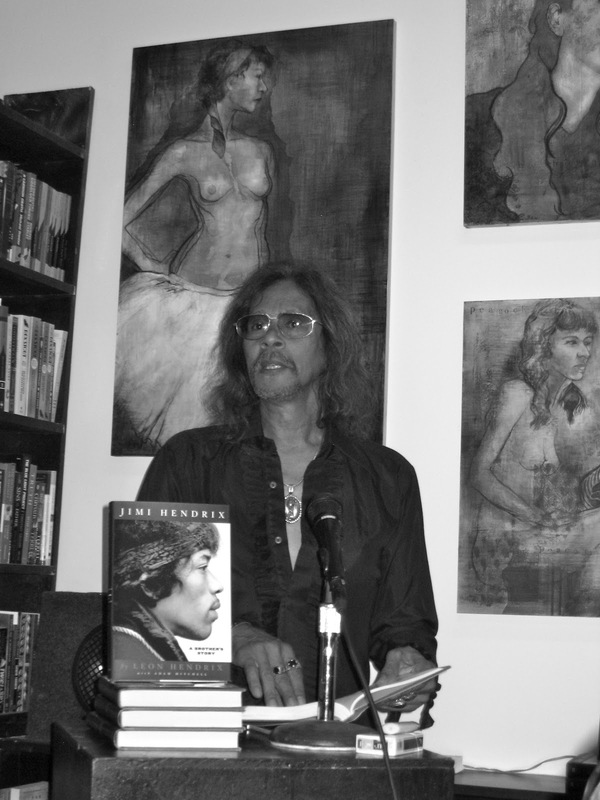 I was cool to juggle some stuff, but what I knew I did not want to miss was Leon Hendrix reading from his new book, Jimi Hendrix – A Brother’s Story at Small World Books on the Venice Boardwalk last night. I raced over there before the sun even set, and found myself a chair in the little back area of my very favorite book store. Mr. Hendrix was still at The Sidewalk Cafe next door, having a little happy hour, so it was very relaxed and no rush … appropriate for the location, for sure. I chatted with some local folks I know, and then Leon Hendrix walked up, held out his hand and asked my name. In his silky black shirt and lots of jewelry, he was pretty smooth. Maybe even more so by his clear groove, as I gleaned from the aroma that there had been a recent sharing of a j on the Boardwalk prior to his entrance. Smooth. 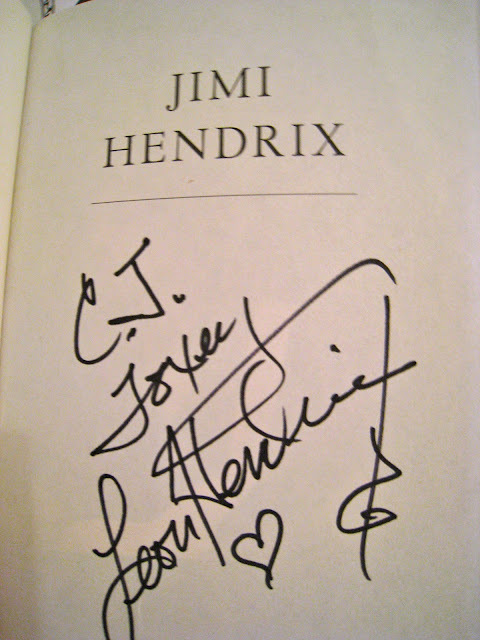 It was standing room only left as Hendrix proclaimed that this was his very first book reading and signing ever! Here in Venice … I love that. He got right to it and read a passage from a chapter called “Vagabond Gypsy Boys”. It felt like he was more comfortable just talking and sharing anecdotes than exactly reading from the book. This turned out to be a treat, as he said that some of the stories he shared weren’t in the book, so bonus. Jimi was always called “Buster” as a boy, we were told, as his real name was Johnny Alan Hendrix, but Johnny was the name of their Mom’s new boyfriend, so their Dad made him change his name to Jimmy Marshall Hendrix. He couldn’t get used to that, so he made everyone call him “Buster”, after the Flash Gordon actor he loved, Buster Crabbe. Buster! Hendrix spoke about how he and Jimi ate horse meat hamburgers and they were the best in the world, and it’s a shame you can’t get them anymore. He said that Jimi played music with Tommy Chong (“Who had a band before his pot career …”), and that his first gig ever was with Ray Charles, because at 16, he was the best guitarist in Seattle for the job. That his first recording job ever was some striptease music for Jayne Mansfield in Louisiana. Someone asked what books Jimi liked or was influenced by, and Leon said he’d never seen Jimi read a book … “He just seemed to know that stuff already”. The whole time he was talking, you could really see in him a little kid that deeply looked up to and missed his big brother. 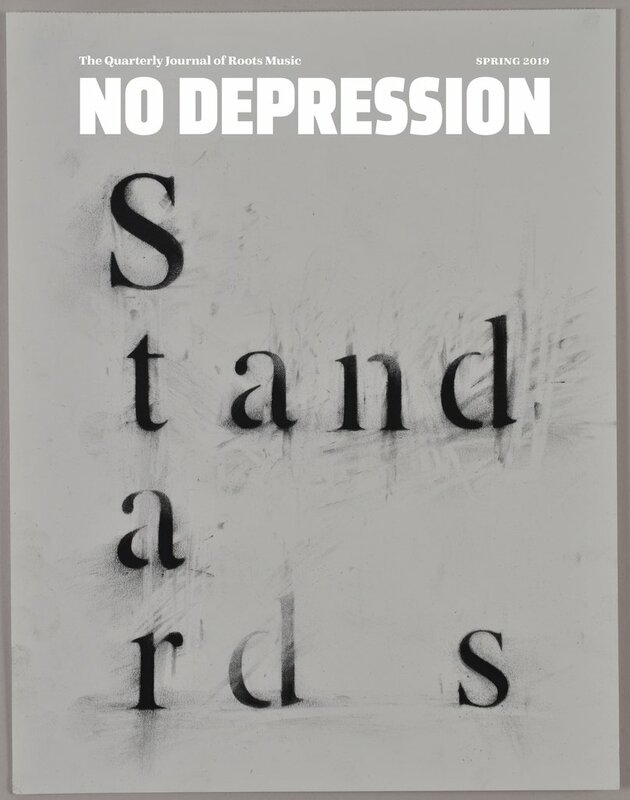 He seemed happy and haunted at the same time, if that makes sense. Someone else asked if it was true that Jimi started out playing on a broom. This was true, but more as an air guitar play thing that he’d sing along to. He first PLAYED on a ukulele from someone’s garage sale that had only one string. He found he could make different sounds by loosening or tightening the tuner on that one string, and that was how he learned to bend each string to do so, so much. He was a leftie, and his Dad thought left handedness was from the Devil …”Which was funny, considering he had 6 fingers!” That was laugh out loud. He went on to say that Dad would tie string around his extra appendage until it would shrivel up and fall off after tightening it for about 6 months … but then they would grow back!! Freak out. Jimi and Leon would wait until their Dad fell asleep drunk and bring in the neighbor kids to terrify them with the extra fingers on their Dad. While funny, I almost wish I didn’t know this stuff existed. Shivvvvvvvver. ANYway … when Dad would come in, Jimi would flip the guitar over to play right handed so he wouldn’t get yelled at for being the Devil. So he could play left, right, upside down, backwards … “He was a genius,” Leon said, with a shrug of pure fact. He read one more small paragraph, squinting without his glasses (“This guy didn’t write the book good.”) and then shut it and said, “Anyway, that’s enough. 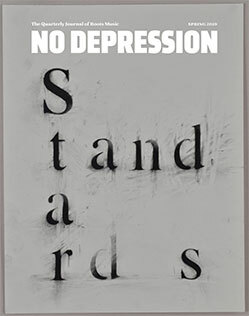 Read the book.” He’s pretty funny, Leon. I get the feeling he’d be fun to hang out with. He was itching to get to the just hang out part of the event, you could tell. Then someone asked why it took him so long to write this book. Leon replied that he realized that in all the other books on Jimi Hendrix out there, all the best quotes were his, so he decided to write his own book. “And it will be the last book on Jimi.” Said firmly. With that, the line formed to get books signed and take pictures and ask more questions. Through it all, and in looking him in the eye while talking, you can see how much pride and pain live in this man who so clearly loved – and loves – his brother. I can’t wait to read all these stories, especially now that I saw the heart of where they came from.